Ramón Peña Sardines for sale. Buy online at Zingerman's Mail Order. Gourmet Gifts. Food Gifts. The Portugese call these “sardinhas”—little sardines. They’re about half the size of a typical tinned sardine. While the fish’s dimensions have been reduced the flavor is not. They’re every bit as rich and even more silky textured. 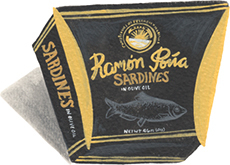 Ramon Peña hand packs their tins with flair, the fish so artfully laid out you’ll feel totally comfortable bringing a just-opened tin to the table to snack from directly.